Resist the urge to just start registering with hundreds of restaurant email clubs. You’ll get more by taking a few minutes to read our tips below to get the most from your experience. We’ll show you how to eat out more often, for free or with deep discounts throughout the year. FavoriteCandle is the largest resource for finding restaurant email club programs on the Internet. You’ll maximize your year round flow of free and discounted meal ecoupons by following our proven strategy below. In just a few minutes your inbox will be filling up with ecoupons from leading national chains and local restaurants in your neighborhood. Sign up for restaurant email lists and your inbox will fill up quickly with free restaurant coupons like these. Most of the restaurants in the FavoriteCandle database are going to give you a reward for signing up and for your Birthday. That’s just the beginning of what you’ll receive for registering for restaurant email clubs. Fasten your seat belts for a stream of ecoupons that will flow all year long. Many clubs will send you free meals or BOGO (buy one get one free) coupons for your anniversary of club registration, your wedding anniversary, ½ birthday and new menu items that they are promoting. Be prepared for a flood of ecoupons for holidays including Valentine’s Day, Mother’s Day, July 4th, Cinco Del Mayo, Teacher Appreciation Days and dozens more. Signup for our email newsletter. Click here to subscribe. We’ll let you know about new and improved restaurant email rewards as we add them to our database. An average of 5 new restaurant chains opens every week in the USA and Canada. They want to entice you to try them. 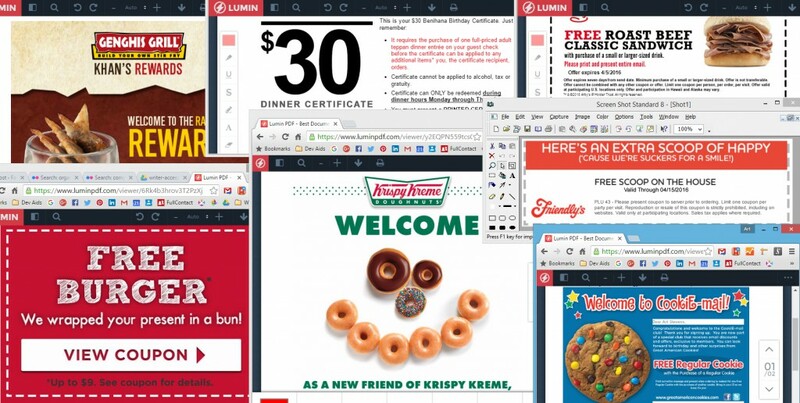 Hot competition has existing chains and single unit restaurants promoting new email rewards all the time. Come back to FavoriteCandle often to see what’s new. Setup a dedicated email address for restaurant email clubs. You are going to be getting a lot of email from restaurants. There will be some real pearls in this email stream. We see invites for free wine tastings with hors d’oeuvres often. Print the ecoupons you receive promptly. Some coupons within the emails sent will not print after just a few days. Your email inbox and email folders are not a good place to store your restaurant ecoupons. Print them! Call ahead to make sure the restaurant location you are visiting will accept your reward. Some are franchisees and opt out of national promotions. Present your coupon to the server ahead of time, not after the check has arrived to verify all is OK. You don’t want to have an uncomfortable scene when the check arrives, especially if you’re celebrating a special event. Bring a photo ID with you. It is sometimes required in the fine print of the coupon you are redeeming. This is especially true when you are redeeming a Birthday reward. Avoid reward offers that ask for too much information or require you to make a purchase to join the email club. We’ve tried to screen these out. To register for most rewards you’re going to be required to register with your name, email address, birth month and day. Most don’t require year of birth. Some restaurants send rewards by regular mail and will ask for your address. Once upon a time restaurant Birthday rewards were valid only on your Birthday. That is very rare to find now. Signup for multiple email clubs and s-t-r-e-t-c-h your celebration by dining and desserting out as many times as you can. Most Birthday rewards are valid for at least the week of your birthday. Many are valid for the calendar month of your birthday. Find enabling friends that will buy half of the buy one get one free offers (tagged as BOGO in our listings). You can return the favor when it’s their birthday. Rewards for Kids have become complicated because of a Federal law that limits solicitation of information on the Internet from children under 13. This means that your children have to be age 13 or older to signup for restaurant email clubs by themselves. The GOOD NEWS! Our listings designate rewards with a PK tag when the email club allows an adult to enroll their children on the parent’s registration form. No children’s email addresses are collected. Ecoupons for kids will be sent to their parent’s email address for rewards that carry the PK designation in our listings. We also have a K tag for email clubs that are for kids only. Kids can sign up with their own email address with a procedure that requires confirmation through their parent’s email address. The K tagged email clubs have special rewards and emails designed for Kids. Make sure that when your child ages out of the Kids’ email clubs that you sign them up for the adult email clubs. The very best rewards you’ll receive will often be just for signing up for an email club. The rewards for signing up will be ecoupons sent immediately or within 24 hours. Be careful signing up for dozens or hundreds of email clubs at the same time. The signup rewards will be limited for how long they are valid. You’ll have an avalanche of ecoupons that will be challenging to use before they expire. Business and leisure travelers! Search your travel destinations for restaurant rewards! FavoriteCandle features regional chains and local restaurants that you won’t find when just searching your home zip code. Search the cities you travel to for reward offers. How about a 2 lb. lobster dinner with no purchase necessary? You can get one in Atlanta anytime during your Birthday Month at Aqua Blue. Do you have a friend or relative that doesn’t use a computer or email? Set up an email account and manage it for them. Register them (with their permission) for restaurant email clubs and bring the printed ecoupons you receive to them. Or use the ecoupons you receive in their name to take your parent, grandparent, aunt, uncle or good friend out for their birthdays and special occasions. Do you know about a restaurant reward that we don’t have listed? Please let us know so we can share it with others using the FavoriteCandle contact form. Watch your email carefully for superb offers unrelated to holidays or occasions. Examples we’ve seen: Free meal or other reward for filling out a brief survey, coupons for regional playoff events. Members of US Armed Forces, law enforcement, fire fighters, EMT’s and paramedics. We verify all the restaurant rewards before we list them and re-validate several times a year. Restaurants constantly change their offers due to market conditions and may send you different offers depending upon where you live. At FavoriteCandle we’re doing the best we can to bring you accurate information. It is impossible for us to guarantee you’ll get the identical offer that is listed.